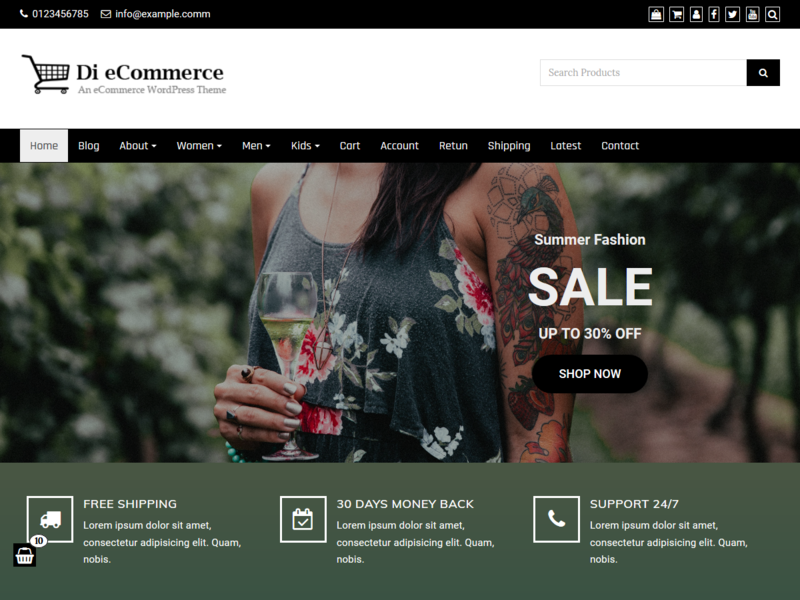 Di eCommerce is a Responsive, SEO Friendly, Fast to Load, Fully Customizable and perfect eCommerce theme. it is specially design and develop for eCommerce websites. it is fully compatible with all popular eCommerce plugins like WooCommerce, Quick View, Wishlist, PDF Invoices and Packing Slips, Easy Forms for Mailchimp, contact form 7 etc. it comes with built in sidebar mini cart feature to boost orders. it is also fully compatible with Elementor page builder plugin to design unlimited unique modern pages. Theme Features : one click demo import, sidebar mini cart, WooCommerce widgets area, WooCommerce options, top bar options, 6 header layouts, footer widget with 6 layouts, typography options, advance blog options, footer copyright section, social profiles, sidebar layouts, mega menu, sticky menu, back to top icon, page loading icon, header widgets, page widget, post widgets, page with left sidebar, page with right sidebar, full width page, full width template for page builder plugins, social profile widget, recent posts with thumbnail widget, translation ready, fully SEO friendly, structured data implemented, search engine recommended structure, compatible with all SEO plugins and much more.